$25 Will enable 1 child to participate in a ‘Try-It’ session where he/she is given his/her first opportunity to experience the joy of sport and active recreation. 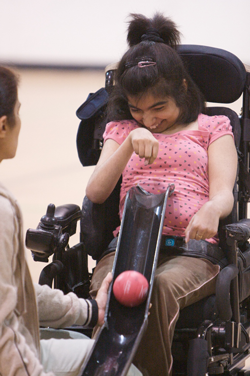 $50 Will enable 1 child to play specially adapted boccia as a form of recreational therapy within children’s treatment centres (as part of an 8-week therapy program). $100 Will provide training and support to 1 coach or other sport leader on how to adapt and deliver sport programs for people with cerebral palsy and similar disabilities. $250 Will enable 1 child to participate regularly in a recreational sport program where he/she will develop fundamental skills, confidence and friendships that encourage ongoing involvement in sport. $500 Will provide 1 ‘Start-up Kit’ to a school, camp, kid’s club or community centre for the introduction and delivery of a recreational boccia program (includes a complete boccia ball set and a specially designed assistive boccia ramp). $1000 Will enable 1 competitive or high-performance athlete to attend a week-long para-athletics training camp to hone his/her skills and prepare for all levels of competition.